Part of my longer term goal is to hike a majority of the "highest locations" on the AT, particularily in the NE. I had been to Mt. Everett about 5 years ago when I was a VHF Rover contester. At that time you were able to drive almost to the top and the Fire Lookout tower was still in place. Mt. Everett is located in the SW corner of Mass on the border with NY. You can drive to within a mile or so and then the access road is gated and you must hike the remaining way. The road is level and smooth so the hike is easy and fast. There's a good campground about a 1/2-mile in with a porta-potty and fire pits. A good future camp site but would have to be in the fall after the mosquitoes have died since there is a lot of standing water. An early spring camp would also be fun. The drive is about 2-1/2 hrs and is especially beautiful in the fall with the trees turning all colors. This was going to be a day trip for me, so I left early in the morning and arrived mid-morning at the entry sign which dates from the 20's or 30's. I parked at the gate and started the hike into the site. You can see the road in is well maintained. 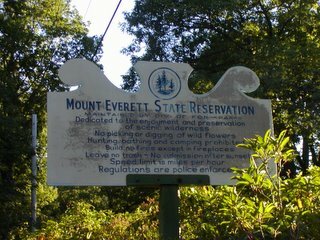 Camping is allowed if you are on the AT. 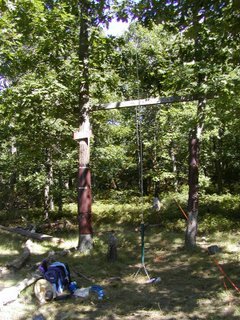 I had my vertical with me since there were no tall trees to hang a dipole. The day was beautiful; clear, sunny, and warm with virtually no wind and view in all directions. busy talking with those folks which is about as much fun as CW QSO's on the K1. About 3pm the local hiker visitors dropped off and I was able to concentrate on QRP QSO's. It's always fun to tell folks where you are, especially portable on the AT, and get their reactions. Almost all folks wish they could be there! I tell them to get out of the house...go to a park or anyplace and set up on a picnic table and have some fun! Of course CW makes it easier to be portable, but a good location and 10w or so of SSB can be equally stimulating. I packed up around 6pm for the hike out and the longer drive back. It was a great day and fun to get "up north." Now I have to start planning for a Mt. Graylock QRP Dxpedition! 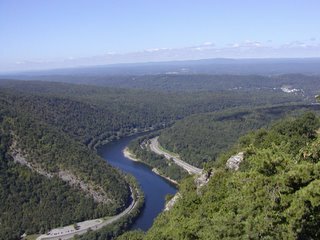 Located at the southern most end of the AT in New Jersey, Mt Tammany "looked" interesting based on reviewing a topo map of the Delaware Gap area. Shown as a high point with a "vista star", I planned on an QRP activation from the area. Parking at the picnic area on the Jersey side of I80, I climbed the steep Mt. Tammany Trail going east out of the parking lot. It was seemingly going straight up! There were a number of other folks, families, groups, etc. climbing in the same direction. Something had to be spectacular for all these folks to climb this relatively arduous trail. After about 45 minutes I got to a very rocky overlook of the Delaware River and the "gap" between NJ and PA. The corresponding viewpoint on the PA side is called Mt. Minsi and it looks like there is some sort of monument over there. A future trip opportunity. The view was spectacular; seemingly a straight down look at the river from about 700' or so above it. There were a ton of people here. Mt Tammany is about another 1/2 mile up the trail. I was hoping to breakout of the trees for that "vista" promised on my trail map. Unfortunately a 1/4 mile later, I was still socked in the trees; perhaps 20 years ago when the map was first made there was a view but not today. Hmmm, what to do now? A careful look at the map showed some more "vista stars" a bit north on the trail. Oh well, let's go. Trails criss-cross this area and it would be easy to make a loop hike. A few miles north, I came out on a clearing used by the Forest Service for helicopter landing for either supplies or people. Nothing really great here also. Let's go a few more miles and do the loop and pass by Upper Yards Creek Reservoir. It was bushwacking a bit on the trail as it was not recently maintained but I got to the fenced in reservoir and hiked along the fence until I got to the Sunfish Pond Fire Road which took me to Sunfish Pond, a popular day-hike area in the summer for picnics and swimming. Now I was back on the AT, about 7 or 8 miles into my loop and still looking for a suitable site to be QRP portable. Heading south now on the AT, after a mile or so, I came to "Backpacker Site #2", a camping area for folks on the AT. It had a nice view to the west so I set up here. It was pretty in the woods but there was still a lot of day-hiker traffic. After 3 or 4 hours of operating with the verticle, it was time to pack up and head back to the parking lot. I still had about 4 miles ahead of me and I wanted to get back before dark as I didn't have any flashlights with me. The hike is near the Dunnfield Creek which looks like it can be spectacular after heavy rains since for the last mile or so, the trail is in a canyon and fallen or washed down trees are rather high along the creek. I'll have to come up here when we've had some extended rains to see the swollen creek. All in all it was a long about 10 or 11 mile hike. 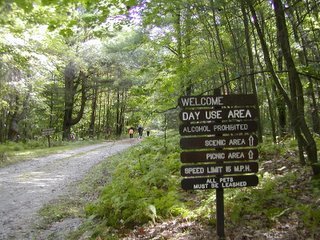 This was an outing to Bear Mtn which is the highest point on the AT in NY and part of the extensive Harrimann Park system. Access is easy and I parked at a public picnic area below the Harriman Lodge at the bottom of the hill. Since it was a holiday weekend, they were charging $10 per car for parking. Being relatively cheap, I elected to walk about 1/4-mile from the public area. It was going to be a warm day. The climb up was hot and there were a number of day-hikers on the AT from the Lodge up to the Lookout Monument at the top of the mountain. About an hour later, I got to the top via the Trail. This area is accessible by car and there were many people wandering around. I took some pictures and then headed east looking for another "star vista" as shown on my Harriman Park hiking map. 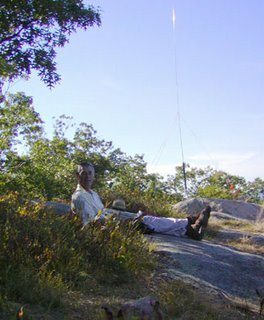 On the way I ran into the "QSY Ham Radio Club" operating the ARRL VHF contest from atop Bear Mtn. What a great location for the contest. There's no higher location in this area and they had a 30' Rohn tower setup with a 6m and 2m beams on rotors. Outstanding! They even got permits for overnight camping! I t was a bunch of real friendly guys and I talked with them, sharing stories, doing an Elecraft show-and-tell, etc. There were some HF guys so we had a good time. I then hiked about 1/4-mile east of there site, setup the vertical and K1, and started to have some QRP fun. It was hot and this site overlooked the Hudson River to the east. I made a number of QSOs, packed up about 6pm and hiked down the very steep "alternative" trail to the lodge area. All in all, it was a fun but hot day! !